Please note: the a9s Elasticsearch tile is still in beta because there are still some essential features on the roadmap. During the Beta phase we received a lot of useful feedback from customers and also from proof of concept installations. The following sections explain the main concerns we have seen and also how we changed the tiles accordingly. A preview of the upcoming features is given in the last section. Where can I download the tiles? You can find the tiles and further information in the Pivotal Network. The table below shows the links to navigate directly to the tiles in the Pivotal Network. The a9s BOSH for PCF tile is used by all a9s service tiles for on-demand provisioning and lifecycle management of dedicated virtual machines. Consequently, each service instance will run on one or more dedicated VMs …read more. Using two different BOSH directors isolates risks. When something goes wrong on one BOSH, the deployments of the other BOSH are not affected. Updating service instances (e.g. stemcell update) is independent from updating tiles. Furthermore, we often heard that the configuration of the a9s BOSH for PCF was too restricted. The beta version required three availability zones and three subnets on the IaaS layer. While this is the recommended setting for production installations, some customers indicated that it’s not adequate for proof of concept installations. 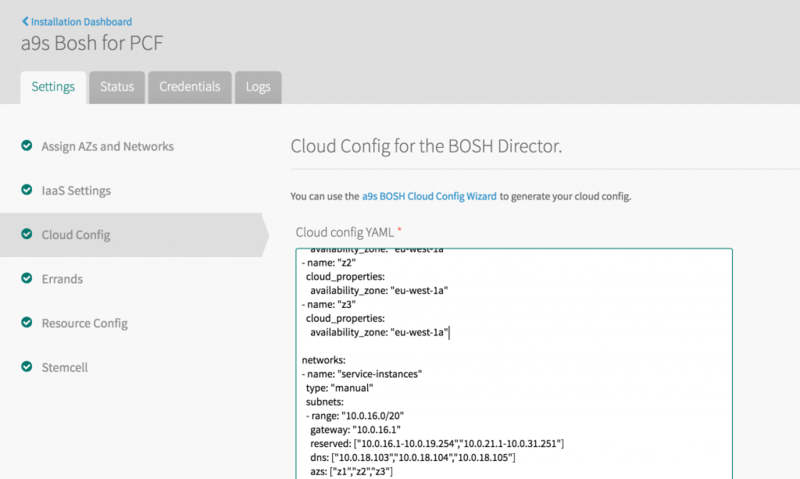 For this reason, we allowed to specify an arbitrary cloud config in the a9s BOSH for PCF tile (see screenshot below). This eliminates the restriction of having three availability zones and three subnets in place. 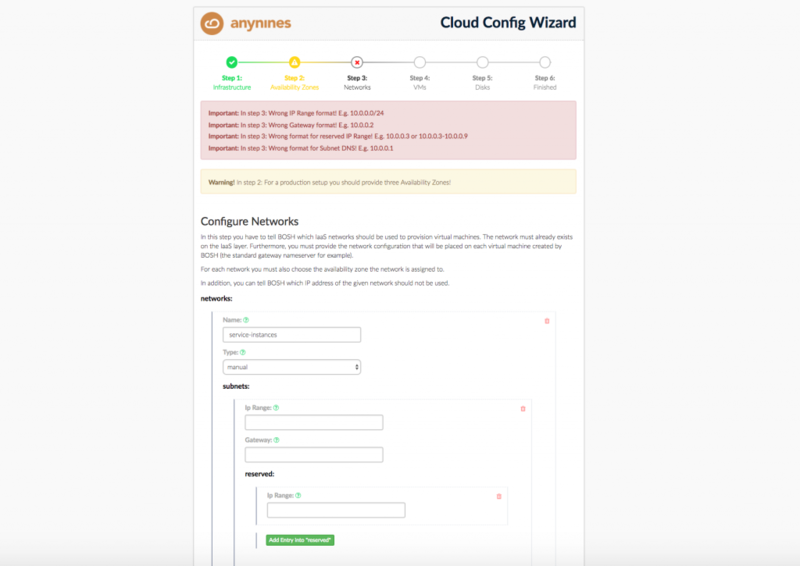 Due to the fact that the cloud config must be specified as YAML and because the YAML structure looks different for each IaaS layer, we also released a wizard at cloud-config.anynines.com, which can be used to create a suitable cloud config. To make this possible, the name servers within the a9s Consul DNS tile must be declared as name servers in the PCF Operations Director tile. This setup delegates all DNS queries from the elastic runtime to the a9s Consul DNS for PCF tile. Many customers were concerned by using a third party DNS solution as the primary nameservers for their platform, especially because they want to use their own internal nameserver for their PCF setup. To mitigate this concern, we recommend to setup a DNS delegation within your company’s existing nameservers and configure them to redirect each DNS query ending with “.a9svs” to the a9s Consul DNS for PCF tile. While this was already possible with the beta version of the a9s Consul DNS tile, there was an issue with multiple PCF setups (e.g. One PCF setup as a staging environment and another PCF setup as the production environment). In the a9s Consul DNS for PCF tile version 1.0.0 you can configure different top level domains for each a9s Consul DNS tile. This configuration allows you to use a top level domain like “stagea9svs” for your staging environment and something like “a9svs” for your production environment. Hence, your DNS servers are able to decide to which environment a DNS query belongs. Installing the a9s MongoDB for PCF or the a9s PostgreSQL for PCF tile makes the respective database available to your PCF end user. Since we have been providing these services on open source Cloud Foundry setups for years now (including the public anynines PaaS), we had to change very little. See section “Minor Changes” for further details. Automatic update of the Cloud Foundry security groups. While the a9s service guard is already available for open source Cloud Foundry setups, this component is not part of the a9s tiles for PCF. Once it is included, it will update the Cloud Foundry application security groups in a way that applications in one space can only access service instances created within the same space. When new nodes are added or removed after the initial creation, the security groups will be updated automatically. This will also work when a node is recreated and receives a new IP address. Automatic backup of all service instances. Like the a9s service guard, this feature is already available for open source Cloud Foundry setups. In the next major release it will also be included in the a9s service tiles. For further information feel free to contact us. Note that we also support customers to get their proof of concept installation running. For the sake of completeness, we also want to list the minor changes that come with the first “non-beta” release. Use Ubuntu stemcell version “3363” across all tiles and service instances. The default sizes of the virtual machines were adapted to have fewer issues during the installation. The configuration possibilities for OpenStack were extended in the a9s BOSH for PCF tile. The service names were changed from “a9s-mongodb” and “a9s-postgresql” to “a9s-mongodb32” and “a9s-postgresql94”. This allows to provide multiple major versions of the same database. A post delete errand was introduced to delete all remaining service instances when a a9s service tile is deleted (e.g. MongoDB for PCF tile, a9s PostgreSQL for PCF tile). The a9s BOSH for PCF tile can now be installed using an access key with the same permissions as the access key of the PCF Operations Director. Thanks to our wonderful team! Going out of beta would not be possible without our great team. They are an amazing bunch of people, thanks to all!